First and foremost, I’m a super charged mom, who loves taking care of her daughter and three young sons. I’m also a bit dog obsessed. 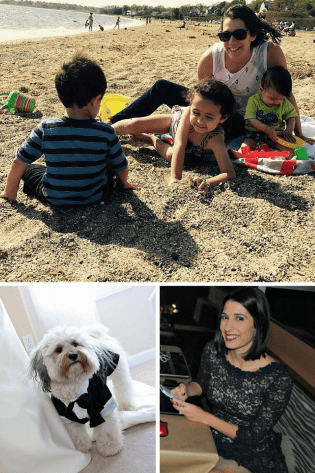 In addition to The Mod Mommy blog, I’m also featured on RhodeShow.com, POPSUGAR Moms Select and 5minutesformom.com. Right now, I’m serving as a brand ambassador for Gerber Brand and ONESIES® Brand. Last year, I was a brand ambassador for HP on the Smart Mom Panel and was a member of the Chick-Fil-A Mom’s Panel. In addition, I’ve partnered with Disney on special projects with #DisneySMMoms. From time to time, I’m invited to be a Tweet Seater for the Providence Performing Arts Center, where I live tweet at the press night performance of certain shows. I’ve also had the pleasure of working with Summer Infant in a focus group called their Voice of Moms Panel, and served on a Mom Advisory Board for Condé Nast during a new product launch for their company. Currently, you can find me on TV turning blog posts into fun, live segments. During my career I’ve hosted on-air radio programs, delivered lottery numbers on television, appeared in national and local commercials, worked as a stand-in on a television show called Waterfront and reported news and feature stories on-air for a local TV station. I love learning about new parenting trends and kids products and I’m excited to share my tips and knowledge with mod mommies everywhere. I enjoy working with PR companies and brands to help get the word out on new products or services. All product reviews and giveaways on The Mod Mommy are considered to be sponsored posts. Readers will be informed with proper disclosure that a brand sponsored that particular post with either product or compensation. Compensation must be received prior to publishing. Rates vary depending on the type of post. If you’d like to submit a product for review on The Mod Mommy, feel free to use the contact form below and I’ll be sure to get back to you within 24 hours. Products to be reviewed must be a full-size sample, are non-returnable and must be equal to or greater than $50. Each number is a monthly average.